Lazy Dog Restaurant and Bar's Spaghetti Squash & Beetballs. The “greening” of the American menu is the major trend of the moment, as chefs direct their creative energies toward produce. Innovation around vegetables has moved from the soup, salad and side dish categories directly to the center of the plate. No longer a consolation prize for meat-deprived diners, the vegetable entrée is now fully realized, providing taste, texture and instant Instagramability. Using the same culinary techniques and touches previously lavished on animal protein has enhanced the appeal and upped the coolness quotient of vegetables of all kinds. Veg focused. Vegan and vegetarian restaurants have moved from the fringes to the mainstream, and some have won serious plaudits along the way. Vedge in Philadelphia is a James-Beard-Award nominee noted for inventive vegetable cookery, and it features a menu both serious and playful. An example of the former is the current Eggplant Braciole, based on the classic Italian roll up. In Vedge’s version, smoked eggplant stands in for meat and is layered with preserved lemon, salsa verde and cured olive. An example of the latter was the restaurant’s Potato Lo Mein, which had shaved spuds in place of conventional noodles. Finished with sesame-soy and scallion-red chile sauces, the dish was a fun and wildly photogenic smash hit. In a nod to its tasty and indulgent fare, Atlanta newcomer Slutty Vegan makes the memorable claim that “vegans can be slutty, too.” The restaurant is dedicated to disproving that vegan food is expensive and bland with its sandwich-based fare like the PLT, grilled plantain tossed in jerk sauce, lettuce and tomato, drizzled in the house secret sauce and served on a Hawaiian roll. Founded as a food truck last summer, the concept drew lines 500 deep and morphed into brick-and-mortar this winter. Chains are getting in on the action, too. Veggie Grill is headquartered in Santa Monica, Calif., operates 37 locations around the country and calls itself a “plant-based zone” free of any animal products. Best sellers include the Sonoran Bowl made with organic quinoa and seasoned black beans, topped with fire-roasted carrots, avocado, salsa, jalapeños and roasted red pepper sauce. Tortilla strips are optional. Veg forward. Mass-market acceptance of vegetables as craveable options is being influenced by an emerging class of fast-casual operations, some of whom, like Coolgreens, Tender Greens and Sweetgreen, declare their greenness right in their names in order to cast a halo of health over their bills of fare. Another poster child for produce invention is Washington D.C.-based Beefsteak, which promotes the power of “Vegetables, Unleashed” in its five locations and uses animal protein strictly as a condiment. In fact, its name is a sly play on patron expectations: The eponymous beefsteak is the brawny tomato variety that often tops a hamburger. The beef-less Beefsteak Tomato Burger, available only in the summer season, shares menu space with its winter partner, the BEETsteak Burger, in which marinated beets take the leading role. Both come dressed to the nines with condiments like pickled red onion, leaf lettuce, sprouts, vegan chipotle mayonnaise, olive oil and sea salt on an olive-oil brioche bun. Other up-and-coming chains pair their proclivity for produce with carefully sourced proteins, like 15-unit Urban Plates, where the chicken is cage free and the beef is grass fed. Their Moroccan Chicken Braise sits cheek by jowl on the menu with Curry Tofu & Vegetable Braise, which eliminates a potential vegetarian veto vote. Veg friendly. Arguably the most imaginative use of vegetables as main dishes is found at broad-menu operations that cater to omnivores. They’ve moved way beyond the conventional vegetable plate, a culinarily lazy entrée assortment of the day’s side dishes. At Twisted Fern in Park City, Utah, the satisfying Root-Veg Cassoulet starts with the classic stewed white beans and herbs, but replaces the sausage, pork or duck that would typically be in there with roasted root vegetables. The nifty Chicken-Fried Portobello — breaded and fried mushroom — comes with a crown of green peppercorn gravy and a side of cauliflower. 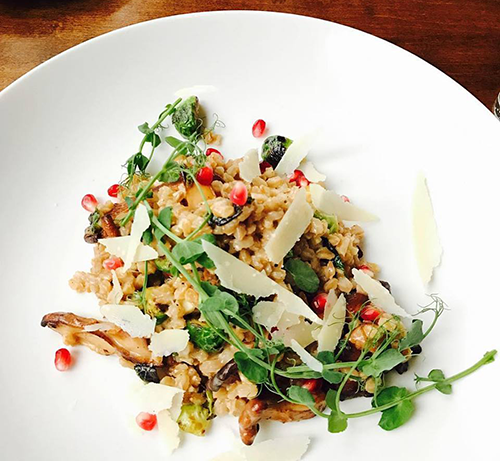 Past specials at the restaurant have included Farro risotto (left) with blistered Brussels sprouts and two umami boosters: Parmesan broth and chanterelle mushrooms. Chains are courting flexitarian diners, as well. Lazy Dog Restaurant and Bar offers a seasonal Spaghetti Squash & Beetballs made with spaghetti squash and zucchini ribbons tossed with olive oil, garlic and marinara. The vegetarian meatball substitutes are topped with Romano cheese, pesto, toasted pumpkin seeds and balsamic reduction. The dish represents the perfect produce trifecta: It’s timed to coincide with consumers’ new-year, healthful-eating resolutions, it taps into the craze for vegetables in place of noodles and it delivers on both taste and texture. And, yes, it’s absolutely Instagrammable.